Same as above, also Prussian binding, Taffeta seam binding, Whalebone, or Featherbone.. These are used in silk or wool dresses, which are not closely fitted, to protect the dress material across the shoulders, and also for holding shields. The sleeves of the dress may be set on this lining. Being attached to the belt, they hold the dress in correct position, if one desires to wear garments that are loose about the waist (Fig. 220). Calculate the quantity of material of the kind you have selected necessary for making, and purchase the same; also the findings. Cut from a fitted shirtwaist pattern or drape upon a form, having only underarm and shoulder seams, and a slight fulness at waist, in front and back. Cut either a small cap or long sleeve as you may desire, or make without under-sleeve. 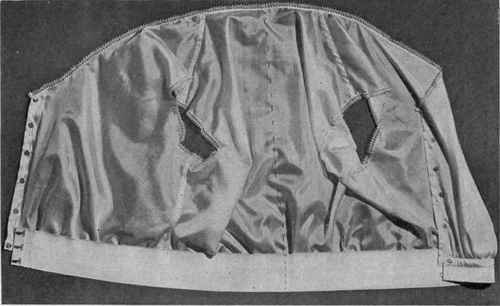 The lining may be opened either front or back. Cut waist all the way to the neck, else it will drag down and be too low when finished. The line at the neck can be marked when the waist of the dress is fitted. Use stitched fells to finish seams of waist; a plain seam at the armhole, bound with taffeta seam-binding, and a narrow hem at the lower part of the sleeve. The neck may be faced and edged with narrow lace, or the edge simply turned back, the lace set on it and stitched to place. The belt may be of webbing, darted so as to make part or all of the belt come above the waist line (Fig. 216). A circular belt, made of soft material and boned, is used for garments that hang in straight lines from the figure, in loose-fitting fashion. Place lower part of waist at center of width of belt, adjust fulness, try on, then stitch. Use snap-fasteners on waist, hooks and eyes on belt. Proceed with this lining in the same way that the lining was prepared for the form (p. 1G2). When cutting lining, cut additional pieces, the same grain as lining, one inch below, three inches above waist line, one center front, side front, and back of waist. Pink upper and lower edges of pieces and baste on wrong side of waist pieces and into seams. These reinforce a waist at the point of greatest strain. The lining for the form was carried to the point of stitching, notching and pressing seams (Fig. 221). Fig. 220. - Semi-fitted waist lining, showing front, neck and belt finishings. 1. Bind with taffeta seam-binding. Fold binding a little less than through the center, crease. Place over edge of seam, so that the wider edge is on the under side of the seam; hold the binding easy. Sew with small running stitches, folding the binding in as the notch is turned, so as not to have a clumsy appearance (Fig. 218A). 2. Turn edges of seams back on themselves, and sew with running stitch (Fig. 2185). 3. Overcast edges (Fig. 217A). 4. Pink seams (Fig. 217B). 5. Stitched fell (Fig. 121). 6. Turn edges together and run (Fig. 217C).